Ever heard someone say, "According to Graves..."? Here's the Graves book that's been waiting 28 years to be published and read. The Never Ending Quest is the seminal work on Gravesian theory. The Never Ending Quest addresses central questions of our times, and all times. 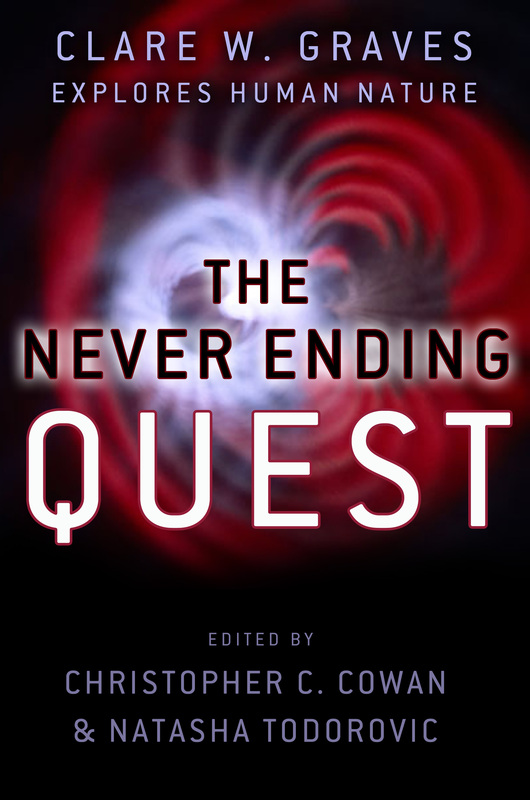 The Never Ending Quest challenges orthodoxies, asks us to do better, and shows how. Listen to Dr. Graves introduce his theory and read a section from the preface of the book in .mp3 (~10 minutes). "Clare Graves's pioneering theories of human nature are the most fascinating I have ever encountered. Christopher Cowan and Natasha Todorovic are to be congratulated on assembling Clare's writings and publishing them in book form. We can now hope that other insightful and creative thinkers will develop further his insights into the mysteries of the human mind and personality." [Ed Cornish edited Dr. Graves's classic 1974 paper, "Human Nature Prepares for a Momentous Leap." "Summing it all up, Cowan and Todorovic have given us a fascinating account of the work of one of the most colorful and generative minds in the history of psychology. We owe them a debt of thanks. This excellent and long overdue book deserves to be part of every substantial psychology library and of many private collections as well." (with Christopher C. Cowan & Natasha Todorovic, Eds.). Santa Barbara, CA: ECLET Publishing, 2005. 578 pp., Index. ISBN 0-9724742-1-8. Allan Combs, Journal of Transformative Education 2007; 5; 192. DOI: 10.1177/1541344607303850. The price is $59.95 for a vinyl-wrap, hardbound (textbook-style) edition. Readers interested in NEQ may also want to consider Clare W. Graves: Levels of Human Existence, a smaller book based on a transcription made by William R. Lee of Dr. Graves's 1971 seminar at the Washington School of Psychiatry with original diagrams and descriptions of his foundational research. Also includes an authorized reprint of the classic article, "Levels of Human Existence: An Open System Theory of Values," from the Journal of Humanistic Psychology, Fall 1970.